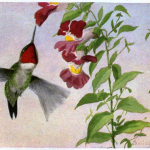 A growing collection of vintage humming bird drawings and illustrations. These little birds are some of the most fascinating and beautiful birds that come to visit our gardens. Wings so fast they actually hum and iridescent feathers make the hummingbird one of our favorites. Add any of these copyright free hummingbirds to your next scrapbook, mixed media art, embroidery or other arts and crafts project. 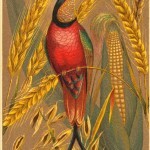 Red hummingbird image used in 1880 to advertise American Breakfast Cereals. Not a North American bird and might not be from nature but it’s certainly pretty. I love the work of Louis Agazziz Fuertes and this ruby-throated hummingbird drawing or watercolor painting is one of my favorites. Vintage drawing of a hummingbird and flowers. 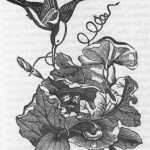 Black and white drawing of a hummingbird in flight. 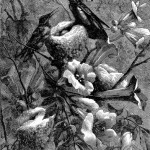 Small black and white drawing of a hummingbird in flight. Two hummingbirds examine their nest among the trumpet vine flowers. Large, vintage drawing of a hummingbird nest and eggs. 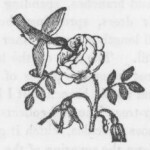 Vintage drawing of a hummingbird and rose.